November is Men’s Health Month, and it is sometimes celebrated by men around the globe who draw attention to their health by not shaving for the month (“No Shave November”) or by growing a moustache (“Movember”). Here at i’move we’re celebrating men’s health by focusing on the wisdom of dudes with great moustaches. First up is Hercule Poirot. I love mystery novels. Something bad happens, and it typically involves blood, a pistol or a candlestick , and sometimes the butler. Thankfully there is a detective who can make sense of the clues, wade through the lies, the motives, and the alibis, and solve the case. Recently I watched the latest version of Murder on the Orient Express. 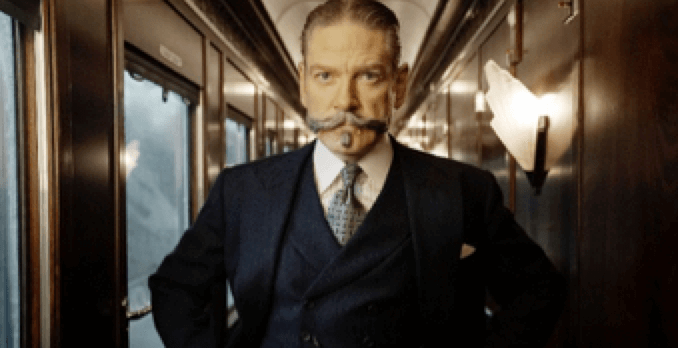 This remake of Agatha Christie’s 1934 novel of the same name starred Kenneth Branagh as the Belgian detective who is trapped on a train with thirteen others, one of whom was murdered in his room during the night. Poirot begins interviewing the other passengers, analyzing the clues to determine who is guilty. Poirot has discovered that all 12 passengers had a connection to the deceased, and all had a motive to kill him. The only solution to the murder that made sense of all the clues is that they all participated in the murder; each of them stabbed the victim one time. They all are guilty. My initial response to this twist was disappointment as I was sure that Michelle Pfeifer’s character was to blame. But then I realized the similarities between the conclusion of this movie and how our bodies and our medical system works. Patients come to see us with a diagnosis. Sometimes they are told they have a rotator cuff tear, a sprained ankle, or a herniated disk. All of our medical system is set up to blame one culprit, and doctors rely on fancy, expensive machines to help with this diagnosis. Patients expect us to focus on the part that is guilty in making them hurt, but the reality is that the accused party has accomplices, and sometimes all of the body is guilty. We see this pattern a lot with the knee which is in a dysfunctional, co-dependent relationship with the hip and the foot. The knee hurts, but the blame often lies with its neighbors. Imagine that those living on either side of your house don’t believe in raking their yards. You prefer a nice and tidy yard though, so you rake your own leaves plus all the leaves from next door that blow into your yard. Who is going to get sore, tired, and start to break down, you or your neighbors? To fix this imbalance, we should not just focus on telling you to ignore the leaves or that you need to get stronger. We need to get the neighbors doing what they’re supposed to do, so that you don’t have to do more than you can tolerate. The morale of the story is, you need a musculoskeletal detective to solve your case. Humans are amazingly complex machines with several parts that are either over-working or under-working (the guilty ones). Once this is discovered, the correct treatment can be initiated, and the body works together like it’s supposed to. Case closed.